I have been writing a daily essay for a few weeks now, each day in that day’s Daily Guides, a group that exists within the Living Metaphysics community (a location on the Ning platform) It is a community that originated within Zaadz (begun by Brian Johnson, a philosopher), which continued in the community when he sold it to the Gaiam Corporation, only separating off when Gaiam closed our doors, with very little time to remove content. I am definitely enjoying the challenge. I have committed myself to do a year’s worth of these. It is my first genuine attempt at a disciplined and focused kind of writing, that might be of publishable quality. I write these in the format of a Science of Mind magazine Daily Guide – in homage to, in hope of someday maybe, and just because I have for so many years appreciated them. Mine are quite long by their standards; but I figure they could always be shortened, by editing if necessary, and perhaps these will be a book someday; or at the least, a legacy of my personal philosophies on life, that I can leave to my children and grandchildren. Since today’s topic is quite universal, I thought to share it, as a blog here at my WordPress blog, because in Missouri – Deer Season is a bigger holiday than Christmas. Your comments and perspectives are quite welcome. “God is life. Life cannot produce death. It is opening day of this year’s Deer Season. Living in a somewhat remote, rural, forested wilderness means that this conservation wildlife practice has a real impact on our lives. 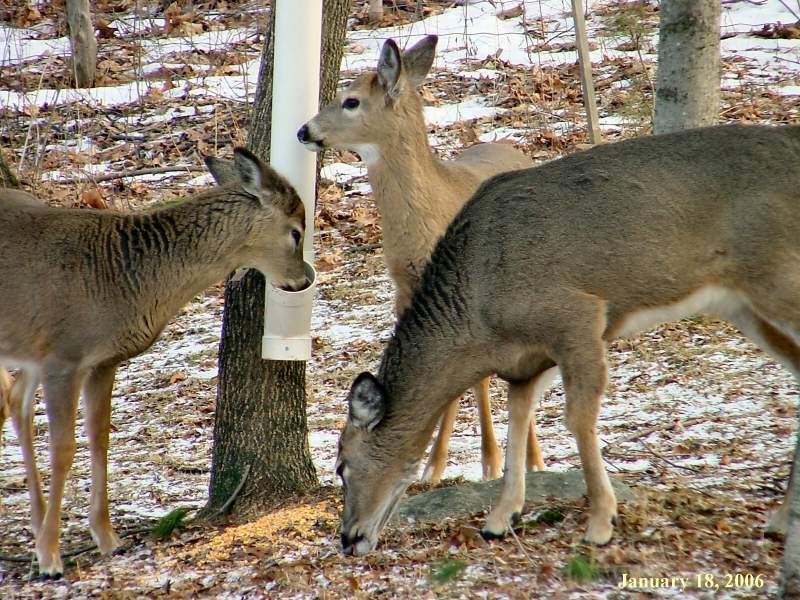 Just up the road, our neighbor has an active “deer camp”, right there on his property complete with the recreational trailers of distant relatives who have arrived to be closer to the less inhabited areas, adjoining our neighbor’s home. It is actually remarkably “quiet” of gunfire within hearing this morning but we will curtail our daily jogs and hikes, and replace them for 10 days, with family hikes after dark which even include our 3 cats. Though all of us actually enjoy this alternative to cabin fever, we only hike in the darkness of our forest (of course, with headlamps) during the “forced” daytime exile of deer season. I thought about an article on oneness perspectives I read this morning in the Science of Mind magazine. Could I somehow apply that perspective about finding common ground with others and see them as “just like me” ? Can I lean upon the spiritual perspectives that I have spent a lifetime in learning, to transcend separation; and so align my awareness with the spiritual realm, that I can feel connected, through a Taoist kind of balance with both the hunter and the hunted ? Can I see a wholeness in what is happening all around me for the next 10 days ? In truth, hunting goes to the core of human beings as a species of life. We are composed of 2 million years of evolution which began with our survival supported by being hunters and few could argue that human beings have evolved to be the most effective, most adaptable and most successful predators on the planet. One Vermont hunter, named Robert F Smith describes that his reason for participating in the practice is that “Hunting is an ancient dance as old as life itself, written into the very core of what we are as humans”. The old Disney movie “Old Yeller” portrays our early pioneer life with a realistic inclusion of hunting as a necessity of existence, in which young boys are initiated into manhood by bringing home meat for the family. Hunter Smith goes even further to idealize a long ago time in human evolution, describing it this way – “Hunting a deer or antelope or harvesting wild berries or nuts is only a few hours of intensive work for several days’ worth of food, while raising, feeding, watering, and protecting a herd of sheep or goats, or planting, cultivating, and harvesting a field of grain, is unending labor. While the tribal system of hunter/gatherers led to equality and leisure time, agriculture brought in slavery, religion, caste and class systems, and the plight of poor peasants and field workers that continues today around the world.” It is a perspective worth considering. Missouri has a serious conservation ethic regarding all aspects of our natural world. In Missouri, the deer and turkey were almost eradicated by indiscriminate hunting – and the population was much smaller then. With modern food distribution, the population is no longer dependent upon hunting for basic survival; but the season that brings many hunters into our community, from the more populated areas of our state and even beyond, is a significant source of revenue for many of the local businesses. I have also contemplated this practice as a need in some human beings for a particular kind of experience, even though it is not one that I personally yearn for myself. An overpopulation of deer does actually pose a danger, when driving on the state highway at night, a danger that I am ever alert to, when the necessity to do so puts me in that position. In Missouri, the influx of settlers in the last half of the 19th century coincided with the rapid decline of the deer population. By 1925, the number of deer left in the entire state was estimated to be only around 400. With concerted regulation by law and efforts to restore the population by bringing new deer into the state, by 1944, the deer population was estimated at 15,000. Now approx 500,000 hunters participate each year in the harvest of approx 300.000 deer statewide. I think in the best of circumstances, the hunter is reverent, the hunter connects with the animal, even blesses it as some traditions do, for being willing to give its life in the food chain that is our world and even, yes, face mortality, face the reality of what death is and does. There is something truly somber about connecting with the eyes of an unarmed animal who you know will die in the next moment by your own hand. Personally, I forego such experiences but I try to understand, that hunters are just like me and so are the deer – the latter is easier for me personally; but the predator must be understood as well. of the wholeness of this planet. in the expression of the hunter and the hunted. all inherent in the practice of a deer hunting season. for it is all one Life force diversely expressing. I wish I could find a scene from Old Yeller that shows the older boy hunting for the family’s food but these “theme song” with movie scenes will have to suffice. If you’ve ever seen the movie, perhaps you can appreciate my using it for illustrative reasons. If you haven’t and are looking for a light-weight, feel-good entertainment, perhaps you should rent it some Saturday night. I believe that we idolize the pioneer days because life made a kind of basic sense – living by day/night cycles, growing crops, tending livestock, hunting game and all the attendant dangers of living remotely. It was a “hard” life physically; and easily endangered in so very many ways, that the movie does a great job of graphically portraying. There were not the modern conveniences that we so take for granted but there was not the complications of our modern way of life, with its own serious stressors either. This is the 150th year, the Sesquicentennial, since the beginning of The Civil War, there will be many battle reenactments in key states . . . In May 2011, we took a little trip, down the Mississip. We saw a lot of water; and in Memphis, we had a little fun . . . This year (2011), the earthquake in Japan and the tornadoes in Alabama and Mississippi devastated human life more significantly; but closer to my own backyard, the Mighty Mississippi is drawing lots of attention, more than it has needed since the Flood of 1993. While there are similarities, there are differences. The Mississippi is the 3rd longest river in No American and it’s watershed is the 4th largest in the world. These are the worst floods to hit the central US in 70 years. 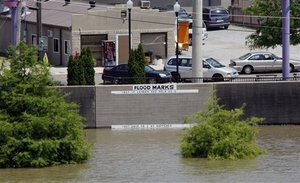 Below Missouri, the 1993 Flood was not big news; but then, during that flood, over 1,000 of the 1,300 earthen levees failed, flooding farmland and small towns and sparing the lower river of much flooding. Major cities like Hannibal, St Louis and Cape Girardeau in Missouri along the Mississippi River, have massive concrete flood walls with heavy metal gates. These protected the old city centers but areas above or below these structures did not have the same protection. Similarly, the combination of record winter snowfalls, and the snowmelts of spring, along with heavy rains over the Midwest – have done their best, quite successfully, to cause much damage. Here is a pretty good overview of the June to mid-August Mississippi River flood of 1993. 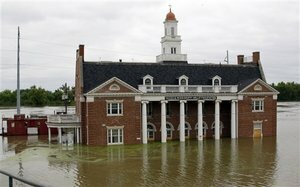 The USGS has some good photos of that same flood here – http://mo.water.usgs.gov/Reports/1993-Flood/photos.htm . They note that on Aug 1, 1993 the largest peak discharge since 1844 was measured at St Louis on the Mississippi River. Before 1927, there were no flood control measures in place on the river. Most of the damage in 1993 occurred in the area from Minnesota to Missouri. In the Fall of 1992, soil moisture levels were already high in the Central US. Winter rain and snow contributed to the saturated soil conditions and so when spring rain and snowmelt came, it could only run off into streams and rivers. In June 1993, the rivers were already running high and a persistent upper level atmospheric pattern developed. Moist air flowed up from the Gulf of Mexico into the Midwest. Other upper level disturbances were crossing the country from west to east and collided with the moisture coming up from the south. There was wave after wave of these storms. Between June and August, some locations had received over 30” of rain (almost 200% above normal). The river crested at St Louis in 1993 at 49.6 feet (over 19’ above flood stage and 6’ above the record set in 1973). The river remained over flood stage for 2 months. Record flooding was also occurring in Iowa along the Des Moines River (which is a tributary of the Mississippi). Because the Mississippi River Flood of 2011 is also a significant historical event, our family decided to take a little trip this last Thursday and Friday down to Memphis, TN (where the river crested 2 days earlier – Tuesday, May 10th – at 48′). Memphis received 11” of rain between April 25th and May 6th and a downtown airport in Memphis was submerged on May 5th when a temporary levee broke. The Mud Island reproduction of the Mississippi River watershed is submerged, though the walkway is high and dry. We enjoyed strolling the riverfront, where the river looks more like an ocean and took in a supernatural carriage ride (perhaps I’ll add more about that in a comment to this blog) and a trolley ride. We stopped at King’s Palace Cafe on Beale St to eat Crawfish Etoufee and were entertained by some old black men playing authentic classic blues live. My friend, Lucienne (in the Netherlands), found this video (without knowing anything more, than that I had listened to Blues in Memphis on Beale St). It so perfectly captured that last part of our Memphis experience, that I had to share it with you in this blog. There was a man in a red bowler hat, that strolled through the diners, playing his trumpet at the beginning of the band’s set. I’m certain the guy in the video, is the guy I listened to that night. Here’s a little video of the flood, made at Memphis, about the same time we were there. We started our contact with the Mississippi at Cape Girardeau on Thursday morning. This year’s flood of the Mississippi is caused by a combination of April deluges (in our area, in one 8 day period, we received 22-1/2” of rain). The flow was made heavier by near-record winter snows in the northern states beginning to melt. The crest in Memphis was approx 48’ – the 2nd highest on record (that record being in from 1937, when it reached 48.7’). Before we got to Memphis though, we traveled towards New Madrid and the Bird’s Point levee. The National Guard had checkpoints in the area and the roads were still flooded, causing the first of our backtracks to detour around impassible roads but we were able to reach the river on more than one occasion, where we saw livestock having to make due with levee hills and river water, instead of their usual pasture and ponds in the floodplain. The plan to breech the levee was highly controversial in Missouri. The State of Missouri asked the US Supreme Court to intervene with the US Army Corp of Engineers’ plan to intentionally blow up the levee. The lower court and the US Circuit Court of Appeals had both already ruled against Missouri, giving the Corps the right to breech the levee based upon a 1928 law. Besides the flooding of the Mississippi itself, there has been record flooding on the Ohio River (which merges with the Mississippi at Cairo). Harrah’s casino at Metropolis IL on the Ohio River is an island in the flood now. They have donated $100,000 to local chapters of the Red Cross. The Ohio River has been so high that barges are passing over dams on the river. The Ohio River crested at Cairo IL at 60.5’ on May 1st. That exceed the 100-yr flood stage and is the highest flood in history. The previous record was 59.5’ in 1937. So this was the highest flood height ever recorded at Cairo (records go back 100 years) on the Mississippi, due to the effect of the Ohio River converging. The new mayor of Cairo (only just sworn in on May 2nd) had evacuated the entire town of Cairo, before the US Army Corps acted. Previous records at New Madrid, MO (which crested at approx 44’) have been – 48’ in 1937, 44.6’ in 1913, 43.6’ in 1975, 43.5’ in 1950 and 42.9’ in 1997. It is still the poorest of the poorest that are most devastated by Old Man River and his ways. Yes, Old Man River keeps rolling along. He’s not in any hurry to reach the sea. The story is still unfolding, and far from complete – at Vicksburg MS, the crest is expected at 57.5’ on May 19th (topping the 56.2’ historic record set in 1927). The Arkansas and Yazoo rivers have contributed additional water flow. The Army Corp of Engineers is faced with yet another unpopular decision. If it doesn’t act, the predicted crest at New Orleans around May 22nd would be anywhere from 19.5’ to 25’ (these predictions are constantly changing, of concern there in New Orleans is that the top of the levees are approx 20’). We heard a lot of news locally in Memphis, about the plan to open a spillway to relieve the river in Louisiana. There are even concerns about the river choosing a new channel to the sea. Baton Rouge and New Orleans would likely flood, if something isn’t done. The flooding of farmland and rural towns would prompt further evacuations and flash flood warnings in Louisiana and Mississippi. The Army Corps of Engineers opened the Morganza Spillway yesterday, channeling Mississippi floodwaters into the Atchafalaya River basin. This is “built-in” to their system about 45 miles northwest of Baton Rouge. The last time that they had to do this was in 1973. Around 2,500 people live directly on the flood path of the diverted water, which could also impact another 22,500 people and 11,000 buildings, as well as 2,264 oil wells which produce almost 20,000 barrels of crude a day. But it does take the pressure off the cities and numerous oil refineries further south in Louisiana. The number of huge oil and chemical processing plants in that region is staggering; and so, the opening of the spillway is realistically as much about big corporations with huge financial clout, as it is about any of “the people” living in New Orleans and Baton Rouge (but making it about the people is better received by the masses ;p and doubtless, it IS about them as well). The engineers estimated that had they not opened the spillway, New Orleans would have been swamped in as much as 20′ of water. If you are interested in learning more – about the Army Corps Mississippi system – there is a good deal of information in this New Yorker article – The Control of Nature: Atchafalaya. I’m not sure about the “river had already crested” part. My understanding was that it was not due to do that, for a few days yet. I saw a graphic in Memphis on their commercial TV showing the river was moving rather slowly. I think the crest in Vicksburg was not expected before Thurs, the 19th; but perhaps it is the opening of this spillway, that allows that determination regarding New Orleans. Below is a picture of the current level of flooding at the Old Train Depot in downtown Vicksburg MS, just yesterday (Sat, May 14th). 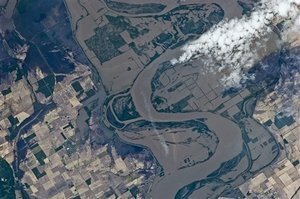 I found this NASA photo taken from the Space Station of the flooded fields in Missouri from the Bird’s Point levee breech by the Army Corps of Engineers. This is actually from the day (Thurs, May 12th) that my family passed through the area of Caruthersville, MO (this photo shows just north of there – note that north on this photo is the lower right corner of the image). Below is an image from Vicksburg – the “Flood Mark” on the river flood wall is the 1927 historic flood level that caused the creation of the Army Corps flood control system of locks, dams and spillways. Now here’s an interesting aside, which I personally attribute to Nature’s innate wisdom – at NOLA.com (note, this is the abbreviation for New Orleans, Louisiana) I found an article titled “Audubon Park Bird Island abandoned”. Is it related to the weather and flooding ? I would hazard a “yes” on this one. Of course, it could also be somehow due to adverse conditions for food continuing in the gulf, from the BP Deep Horizon incident of a year ago. The Audubon Park Bird Island in New Orleans, LA houses one of the most prominent rookeries in the region for great egrets, snowy egrets, cattle egrets, herons and double-crested cormorants. On our own journey, we did see such birds scattered about the receding floodwaters in Missouri, Kentucky and Northern Tennessee. Anyway, the article says that “some birds indeed arrived at the island early this year, began mating, buidling nests and laying eggs but in early April, they all mysteriously disappeared, leaving behind nests and eggs.” You can read more at the NOLA.com link above. You are currently browsing the archives for the Wildlife & Nature category.